It was the end of kindergarten. The school celebrated the end of the year will all kinds of activities including an all school talent show. I was astounded when my very shy six year old came to me and told me he had signed up. “What will you do?,” I asked nervously. This was my kid who never wanted to walk into preschool without holding my hand. “I am going to sing the “God bless the USA” song,” he replied proudly. We chose an American flag shirt and suspenders and cap that matched. He insisted he needed to carry a flag. I thought, “ Oh dear, one more thing to manage on stage.” But he was insistent. And finally the big day arrived. As the show progressed I became increasingly nervous. This was a very bad idea I thought. I could go grab him and get in the car but I had two little ones with me and it was not possible to make a stealthy getaway. I started to do deep breathing trying to stay calm hoping the room full of elementary students would be kind. Finally the curtains opened and there he was looking so small and alone on the big stage. The music began and I closed my eyes in trepidation. And then I heard this strong booming voice coming from this little person. No quivers, no trembling, just a sweet clear voice with no hesitation singing his little heart out. “ And I won’t forget the men who died (complete with foot stomp) who gave their lives for me”. And the next thing I knew the entire audience was standing up and singing along. 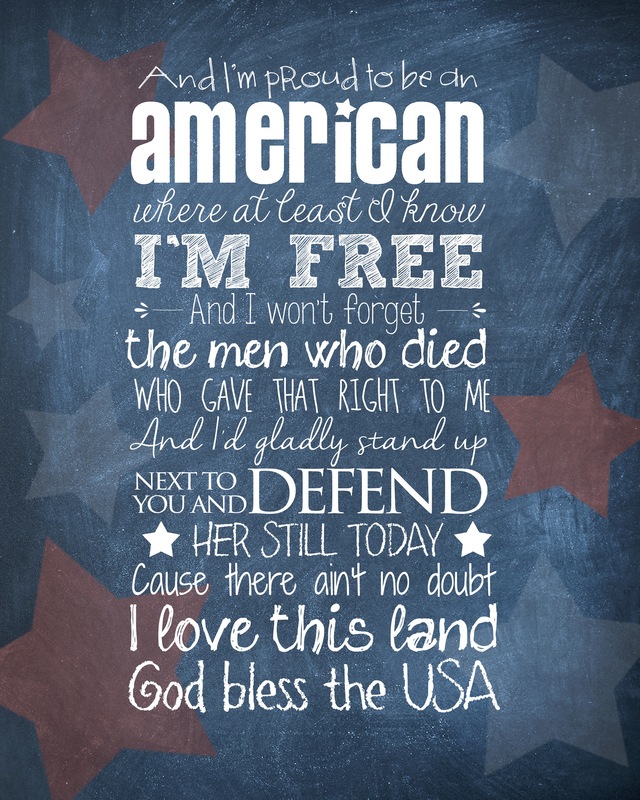 Thank you Lee Greenwood for a song that speaks to generations and comforts those of us whose children are away protecting our freedoms. And thank you son, and all those who are away from home on this holiday on watch for our nation. God bless you and the USA. Growing up military I have always loved that song. My favorite memory will be at USNA it was finally Parents weekend of Plebe summer I would soon be reunited with my 17 year old son for the first time. First however we were in Alumna Hall hearing the dignitaries. Stationed there at the time was the singing superindent the Admiral led the entire auditorium in song. And they played this one-all the young men and women singing, as they got to each regions part of the song the mids seated stood to sing their part. Let me tell you Texas has some spirit. My son is currently serving as a Marine Capt. My youngest is a Firstie at the acadamy and has already been selected for Subs.